10 Simple Ideas To Add Spookiness To Your Home! 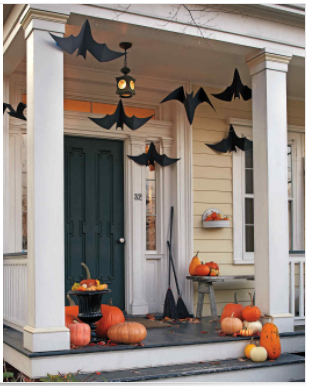 Do you love the spook-factor of Halloween and adding touches of that around your home to bring delightful shrieks from all who enter? We have reached the conclusion that we like high impact decorations that are very simple to put together, making it unnecessary to have tons and tons of decorations to fish out of storage!! We hope you like the 10 ideas we have gathered here for you to add just the right amount of spookiness to your home!! 1. hanging ghosts that you can light up! What is it about hanging ghosts, especially when they light up? Children are fascinated by them. These only require a clear plastic ornament that you can get at any craft store, gauze, black felt for the eyes, and glow sticks. They are very easy to put together! All you need is a paper plate, poster board, black paint, and decorations of your choice! EASY!! The east instructions can be found at Parents. We don't of one child whose eyes don't light up over helium balloons and getting to take one home. Decorate with these jack-o-lantern balloons and let them go home with your family or guests as a treat! Do these look easy or what? The instructions (not that you need them) can be found at Martha Stewart, along with 6 other spooky ideas. Don't you love an easy pumpkin carving idea that is creative and creepy? There's nothing like mice crawling all over the pumpkin on your porch to bring on that creepy feeling!! The instructions and other pumpkin ideas are at Martha Stewart. 5. Does it get more skin-crawling creepier than a spider egg sac? All you need is a foam ball, white batting, a white stocking, and plastic spiders of different sizes! So easy!! Find the instructions at Martha Stewart. 6. when did your candlesticks get so covered with cobwebs? Yes! it happens on halloween! To add this spooky touch to your home all you need are a pair of your candlesticks, candles, gauze, plastic spiders, and dry leaves from your yard! Instructions are at Martha Stewart. 7. what is halloween without bats flying everywhere? Especially harmless ones! You only need black paper and string or fishing line to hang these lovely bats with. A template is even included in the instructions. Thanks again to Martha Stewart for bringing the bats to your Halloween porch! 8. who's that looking at you from the mirror? Cling-vinyl ghosts stick easily to your mirrors and add the spookiest effect to your "haunted house"! 9. Are you planning on inviting mummies to your home for halloween? mummy lights will take care of that for you! You only need jars, gauze, wiggle eyes, and tea lights!! A thank you to Hi Sugarplum for this idea and instructions! 10. floating head ghosts!! creepy!! The supplies needed are foam mannequin head, cheese cloth, mod podge, an eyelet for hanging, and the string. Simply Designing has all the instructions for you. want some free printable clip art from Martha stewart? Go here to get a great variety! Thank you Martha Stewart for all your spooky ideas and free printable clip art!! enjoy creating the creepiest, spookiest, and skin-crawlingest halloween ever!! we love helping you make your holiday's simplify and shine!! Newer PostDo You Love Spooky Dinners!! Older PostCreate Coziness In Your Home!